Wipe it out of your thoughts: Despite its stunning resemblance to the toilet paper-loving bears Americans see on their TV screens, Sochi's ice-skating Opening Ceremony bear is not a Charmin bear. How do we know? Well, because the company itself is quite eager to distance itself from Russia's robotic mascots. During the Opening Ceremonies for the 2014 Olympics — held in Sochi's Fisht Olympic Stadium — the Winter Games' mascot took the stage with a robotic bunny and leopard, gliding onto the ice and into the nightmares of every child tuning into the event. 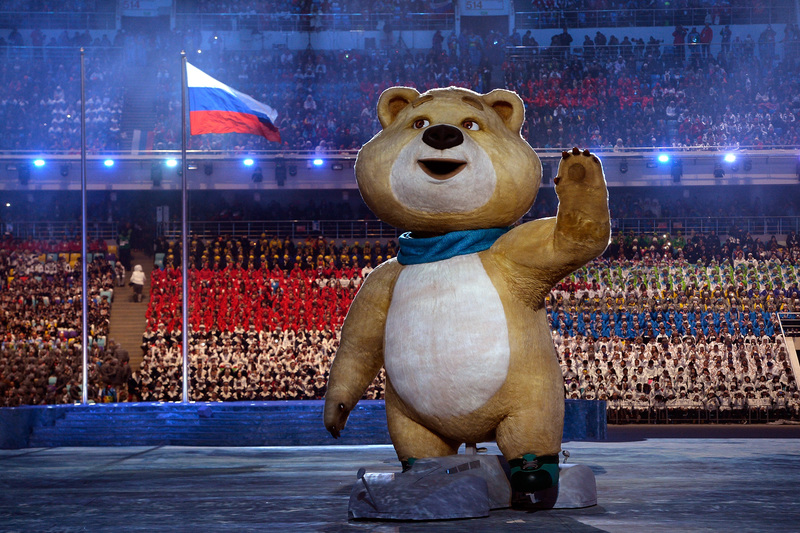 But besides keeping children up at night, what was Sochi's intention of showcasing the ice-skating bear? To bring awareness to the global warming and poaching crises plaguing polar bears in Russia and beyond. Commendable, yes, but, unfortunately, the bear isn't yet achieving that goal. Mostly because... that's a polar bear? With the Opening Ceremonies yet to air in the United States, it's likely Charmin will need to continue to flush comparisons (sorry) in the next 24 hours. And here's guessing Sochi will be fine with that. Because, let's face it, the city hardly needs any more toilet paper dominating its headlines.